Do you think you’re storing your vaccines correctly? Vaccines are a valuable resource to provide immunity from disease and treat sick animals. 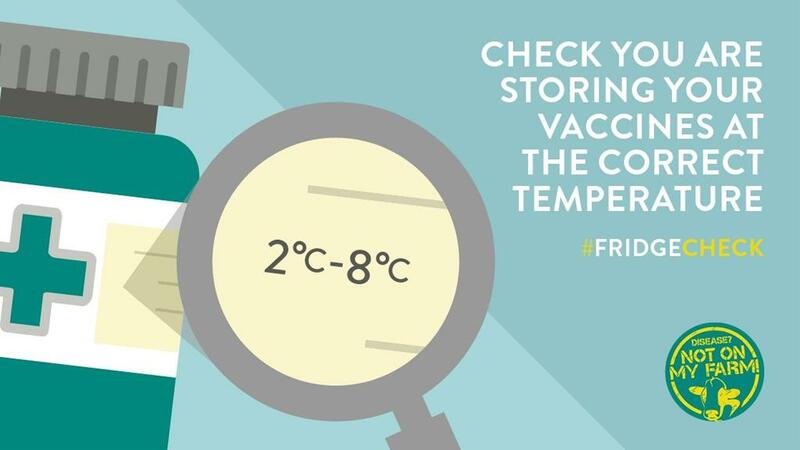 However, failing to maintain the correct fridge storage temperature has been shown to compromise vaccine effectiveness and consequently animal health. Paul Williams, MSD Animal Health UK technical manager for ruminants, explains why farmers should pay more attention to their farm fridges. “Recent research conducted by MSD Animal Health has shown that not one farm fridge that was monitored stored vaccines at the correct temperature range of between 2 0 C and 8 0 C.
“In a significant number of fridges, the temperature was elevated above 8 0 C for long periods of time. In the worst cases some fridges had been at 0 0 C or below 0 0 C long enough for the vaccine to freeze vital contents and become ineffective. ‘Disease? Not On My Farm!’ is promoting how to store vaccines correctly in February and March.